“Really, Lauren? You’re busting out the Christmas decorations already?” Trust me, I get it. 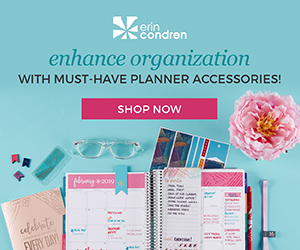 It’s a little crazy to start talking about the holidays when we haven’t even gotten to Halloween yet, but before you give me the side-eye, I PROMISE you’ll be happy to have the heads up on this one! A few weeks ago when I was at Gen Beauty the awesome people over at IT Cosmetics gave me this new Ulta Exclusive brush set to check out before it launched online. Truth be told, I’ve been lusting after their brushes for years, and the only thing that’s kept me from splurging on a set is sheer willpower. My rational brain knows I already own enough makeup brushes, but my beauty-brain is never satisfied. I want to try them all…ALL THE BRUSHES ARE BELONG TO ME (#nerdreference). 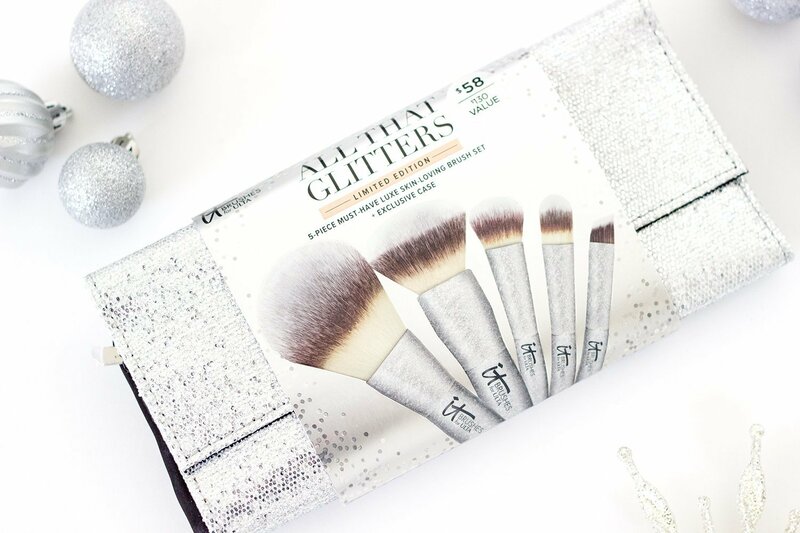 ANYWAY, this stunning set is finally available for purchase on the Ulta website, so I wanted to give you guys my thoughts in case you’d like to add it to your holiday shopping list (or wish list…you know I won’t judge). There’s no doubt about it – this set is a stunner. 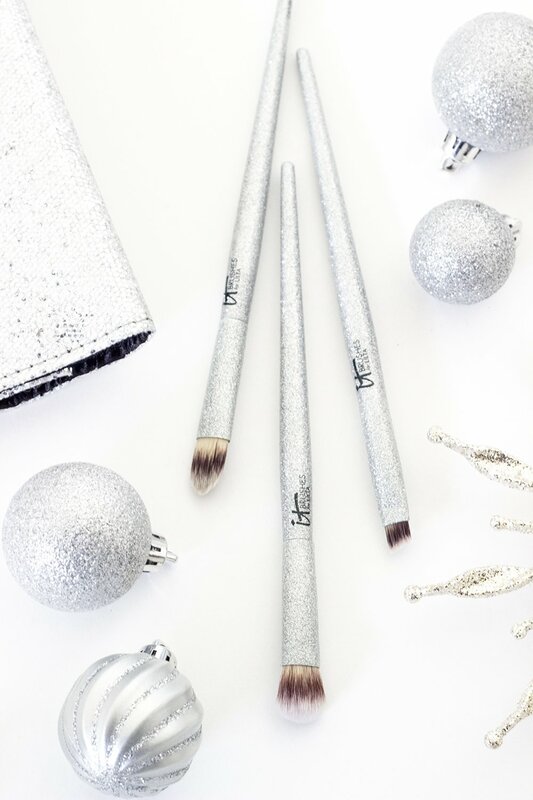 The brush handles and ferrules are all sport one consistent, extra sparkly silver design that totally captures the glam feel of the holiday season. Even though they look like they could have some heft to them, they’re actually very lightweight in the hand. Also, even though the handles are textured, they still feel quite smooth and comfortable to hold. The brush heads themselves are seriously amazing. 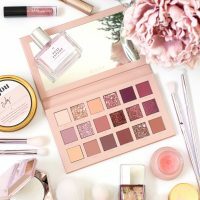 I’ve always known that IT Cosmetics makes soft, luxurious brushes, but you don’t really understand how soft they are until you actually touch one to your face. They also hold up really well to washing and are virtually shed-free! On the flip side, while the brush roll is beautiful to look at, it’s unfortunately made with chunky silver glitter particles that have a tendency to get EVERYWHERE. As something that’s designed with travel in mind, I’m not happy about needing to worry about fallout getting on my clothes or inside my bag. The magnetic closure is nice and secure, and there’s an extra zippered pocket inside for on-the-go storage, however it’s not really big enough to store a phone or other evening essentials if I wanted to use it as a clutch. Long story short, I wasn’t overly impressed. It has that “mass produced holiday packaging” vibe that lacks the quality of permanent releases from their collection. Overall I think IT Cosmetics did a pretty excellent job curating the types of brushes they wanted to include in this set. You get two larger face brushes and three small face and eye brushes for more detailed work. 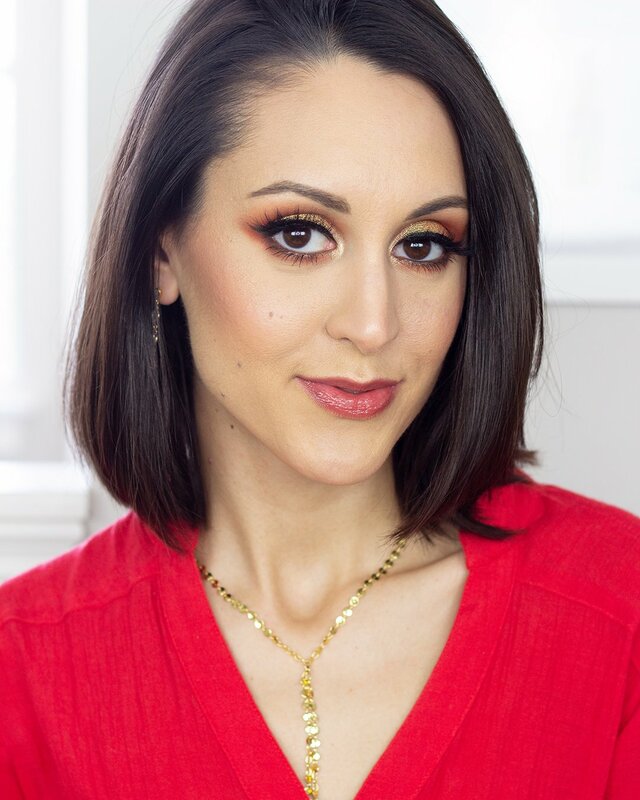 While it’s not totally comprehensive for doing a full face of glam makeup, it gives you a great starting point. So let’s start out with the Brilliant Powder Brush (which might just be my favorite of the whole set). What I really love about this brush is the shape of the bristles. 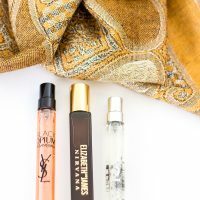 It’s slightly tapered, which allows you to easily powder under your eyes and around your nose, while still being large enough to cover ground quickly. 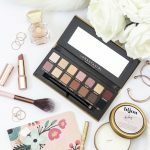 It picks up just the right amount of product and makes setting your makeup a piece of cake (while avoiding looking like one). The Radiant Foundation Brush also makes me really happy. One of my biggest pet peeves with brush sets is when I see they include a paddle-style foundation brush. If you’ve been hanging around the beauty community much in the last 5 years, almost every single blogger/MUA/beauty guru out there is either reaching for a Beauty Blender or a buffing brush to apply their foundation. 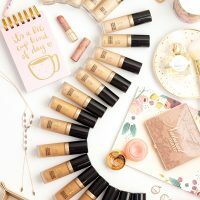 Paddle-style foundation brushes are just generally harder to work with IMO, especially if you’re less experienced with makeup application, so I want to give IT Cosmetics a big high-five for including something I’ll actually be excited to use. As for the brush itself, the bristles are the perfect density to blend your foundation in like a dream. If you’re wondering why mine looks a little wonky, I think it’s that the bristles got splayed inside the packaging, but I’m pretty sure once it’s been through a deep clean they’ll straighten themselves out. Then you have the three detail brushes. The only one I’m not entirely enthusiastic about is the Luminous Concealer Brush, which, like a flat foundation brush, is not my favorite style to work with. A stiff, flat brush like this is great for spot concealing, but not so much for blending in concealer under your eyes. 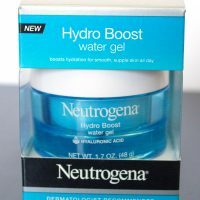 Personally I think I’ll end up using this more for applying glitters and pigments to my eyelids, as it’s the perfect shape for densely packing on product to a precise area. 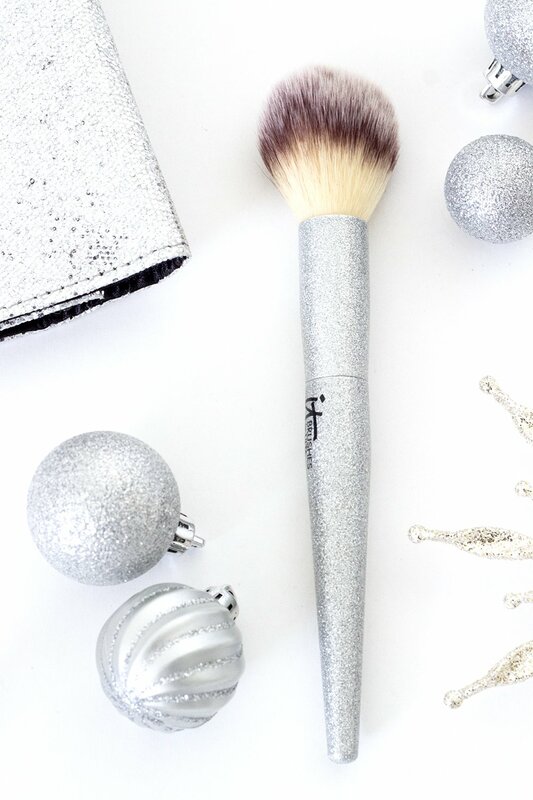 The Stunning Eyeshadow Brush, on the other hand, is perfection. This fluffy brush blends out color on your lid or in your crease with incredible ease. Even though the bristles are incredibly soft, it also has no problem picking up product from the pan. 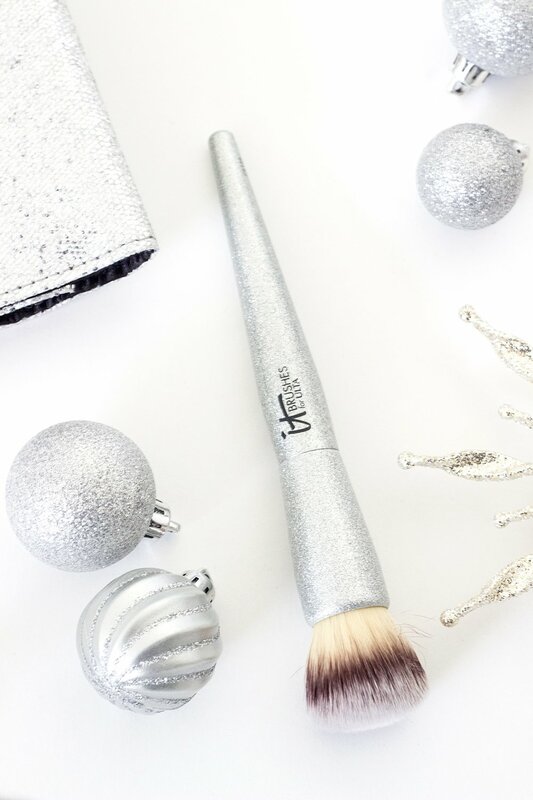 Last is the Dazzling Liner/Brow Brush. I’m really happy they decided to include an angled precision brush like this one, because I think they’re way more versatile and easy to work with than a pointed liner brush. You can quickly and easily create a sharp wing, smudge out your lower lash line, or fill in your brows with this brush. I will say, it’s a little bit larger than some other angled liner brushes I own, which has both good and bad sides. 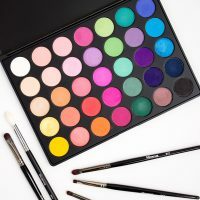 You can definitely apply product more quickly, as you can cover more surface area in a single stroke, at the same time you have to be a little more careful to keep things neat and tidy. As far as holiday brush sets go, I think this one is awesome. 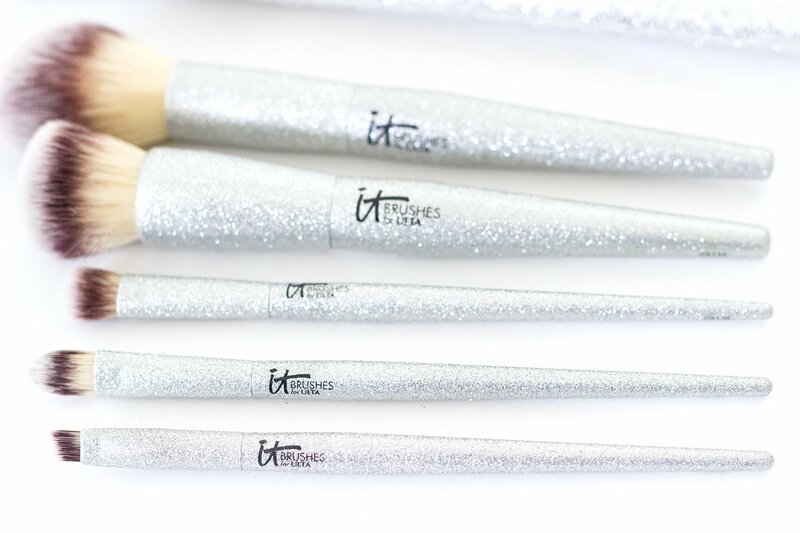 The quality of the brushes is top-notch, and they’re undeniably beautiful to look at. If you’re a relative newbie to the makeup scene, All That Glitters is a great starter option. You’re getting a very standard, basic selection of brushes that make up the core of any collection. 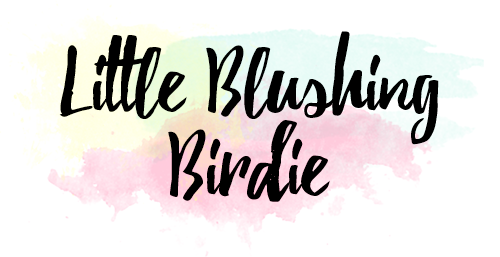 With the addition of maybe a blush brush and a crease blending brush you’ll have basically everything you need to create a whole variety of looks. 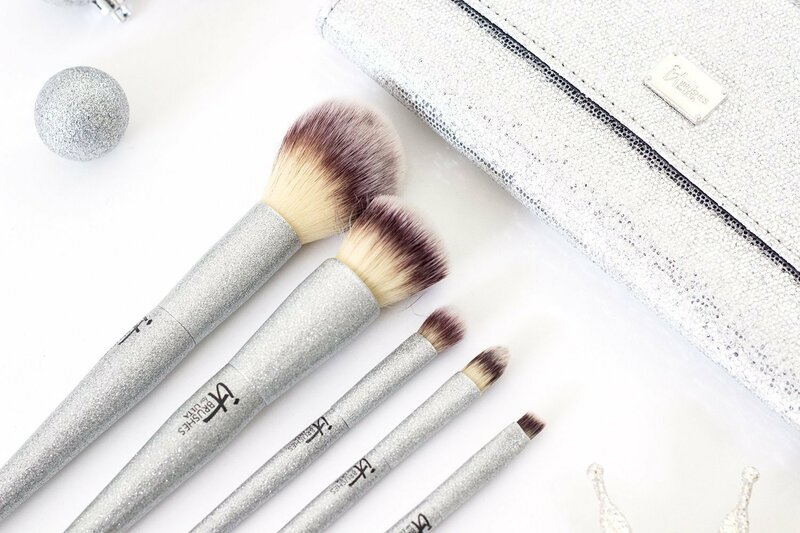 If you’re a seasoned vet, will these brushes excite you? Maybe, and maybe not. Odds are you probably already own brushes similar to these ones, so they may not offer a lot of variety to your collection. But, if you’re in need of an upgrade, or just want to have a few more staple brushes on hand, these ones are certainly an excellent option. Price-wise I’d say the cost of this set is on-par with other high end brands. Are there more affordable options out there? Sure. But good brushes can also be looked at as an investment that will last you for years to come. Also, if you aren’t feeling the glitter vibes, never fear! 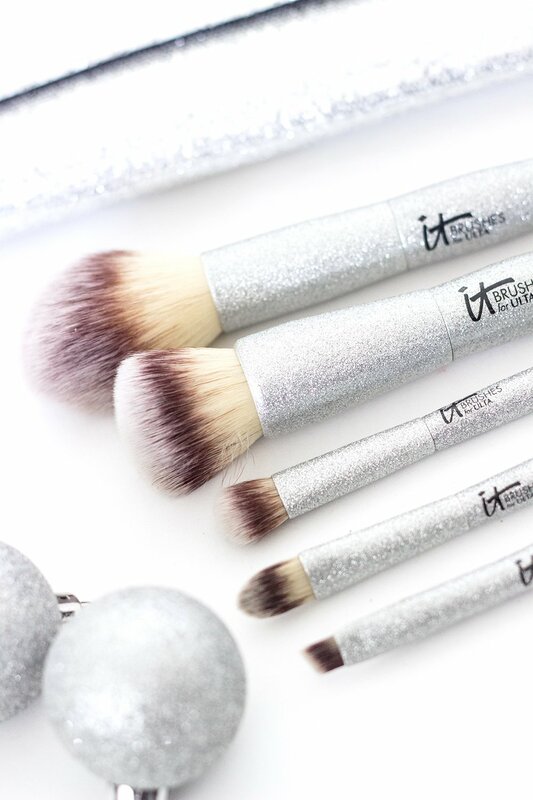 There are tons of other IT for Ulta brush sets available you might enjoy better. 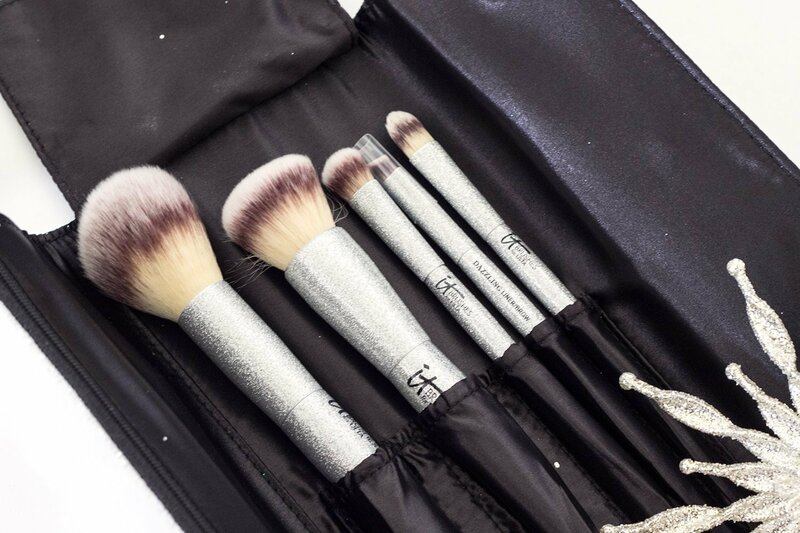 The Velvet Blurring Ultimate Luxe Set and Beautiful Basics sets are a little more classic style-wise and have similar offerings in terms of brushes. I’d love to hear your thoughts on this brush set as well! Have you already tried them out? 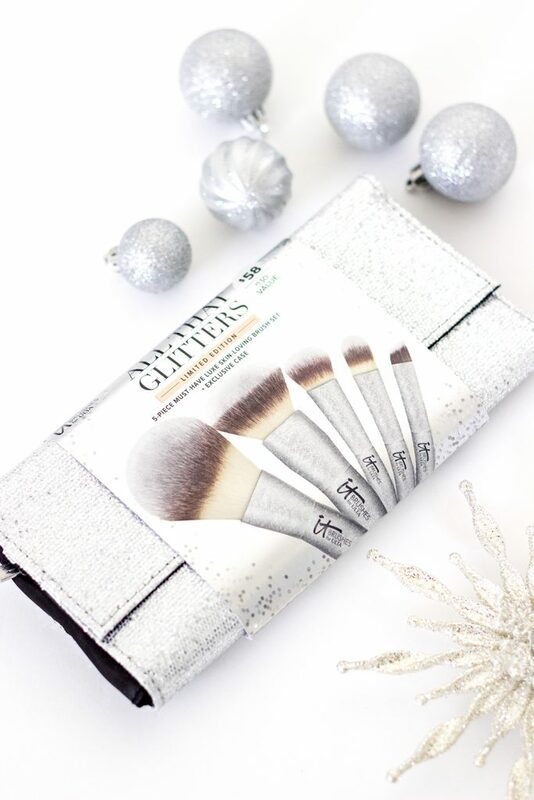 Would you consider picking up a set for someone this holiday season? Let me know in the comments below! 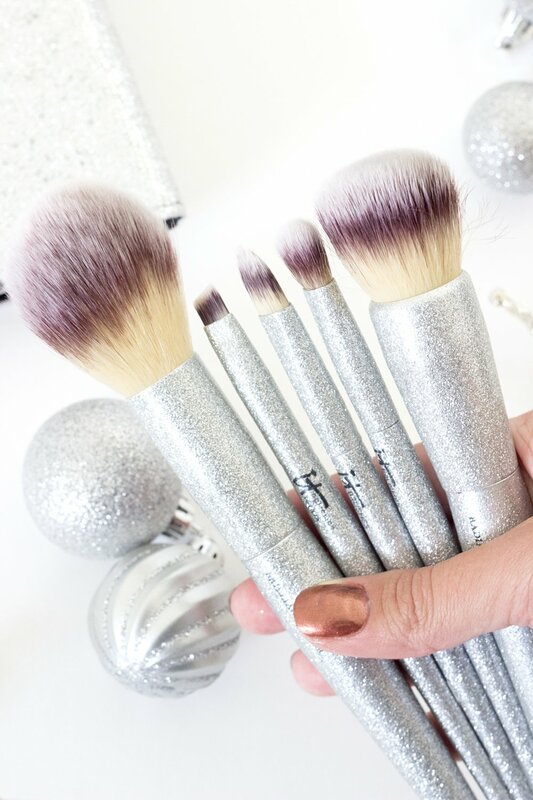 Are brushes on your holiday wish list this year?